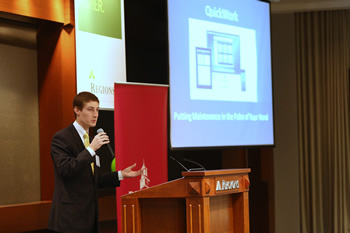 Josh Kendrick, a Samford University student minoring in entrepreneurship and a resident of the Brock School of Business Student Incubator, impressed the judges so much with his company and business plan for Quickwork, LLC, that he won the overall 2014 Regions New Venture Challenge competition. Kendrick, a senior from Ramer, Ala., took home $7,500, the top prize in the sixth annual competition, to use as seed money to start his business. He has developed a mobile application or "app" for smartphones (QuickWork) and online program to streamline operations and repairs for major corporations. For example, if a light bulb goes out, instead of filling out traditional paperwork and waiting on the repair, facilities departments will now be able to go to the app and submit the repair as it happens and a repair order will automatically be generated. "I believe that my app will help companies become more efficient in the way they handle repairs and maintenance," said Josh Kendrick, founder of Quickwork, LLC. "I am honored to have won the Regions New Venture Challenge; now my dream of making Quick Work a reality can come true." Each finalist team took home seed money in the Regions New Venture Challenge. Second place ($5,000) in the Open Division went to Work of Worth, a business that trained women in rural India to weave silk to provide them an alternative to entering prostitution. The third place winner ($2,500) was Release Rowing, an organization in Chattanooga that trains visually-impaired people to row. BUSA 100 winner Destination Station, a subsidized day care center in Memphis, Tenn., took home $2,500 as top prize. Second place at $1,500 went to Recycle and Return, a for-profit recycling company in Birmingham, and third place at $1,000 went to Cereally?, a healthy cereal restaurant in Birmingham that used the same concept as frozen yogurt shops. Birmingham-based Regions Financial Corp. has supported the business plan competition every year since 2008 through financial support and as host of the business plan finals. Students from Samford's Brock School of Business compete in a semifinal round to reach the finals in the competition. There are two categories in the competition: the BUSA 100, for first year business students and the Open Division for upperclassmen, M.B.A. students and recent graduates from any major on campus. Three teams in each division make it to the finals, and then they present to three Birmingham-area judges who are highly regarded in the business community. This year's judges included Dawn Kent Azok, Alabama Media Group; Duke Hinds, Regions Financial Corporation; and Bob Dickerson, Birmingham Resource Center and Brock Entrepreneur-in-Residence. "Our business plan competition is unique in that it is opened to first year business students from the BUSA 100 class as well as to upperclassmen, M.B.A. students and recent grads," said Franz Lohrke, Brock Family Chair in Entrepreneurship and creator of the program. "We are very grateful to Regions for recognizing the importance of holding these types of student competitions, and for helping us grow future entrepreneurs."